Jason (Dacre Montgomery) was the star football player at his Angel Grove high school. After getting busted for a prank gone wrong, he finds himself under house arrest, having to attend detention every Saturday. In the class, he meets Billy (RJ Cyler). Billy is on the spectrum and is bullied by other classmates. Also in the class is Kimberly (Naomi Scott), a once popular girl now shunned by her former friends. Billy convinces Jason to go with him to a gold mine Billy used to frequent with his father. Billy and his father would search for “treasures” at the mine. After running into Kimberly, the find two other students from Angel Grove, Zack (Ludi Lin) and Trini (Becky G.) at the mine. Billy’s treasure hunt unearths ancient coins that grant the teenagers special powers. When the group meets at the mine again, they come across a spaceship buried deep within the ground. A robot named Alpha 5 (Bill Hader) greets them and introduces them to Zordon (Bryan Cranston). Zordon was a Power Ranger defeated long ago by Rita Repulsa (Elizabeth Banks) trying to protect Earth’s zeo crystal, responsible for life on the planet. Jason and his new team must learn to work as a team and find their ability to morph into Power Rangers before Rita can come back and steal the zeo crystal, ending life on Earth. 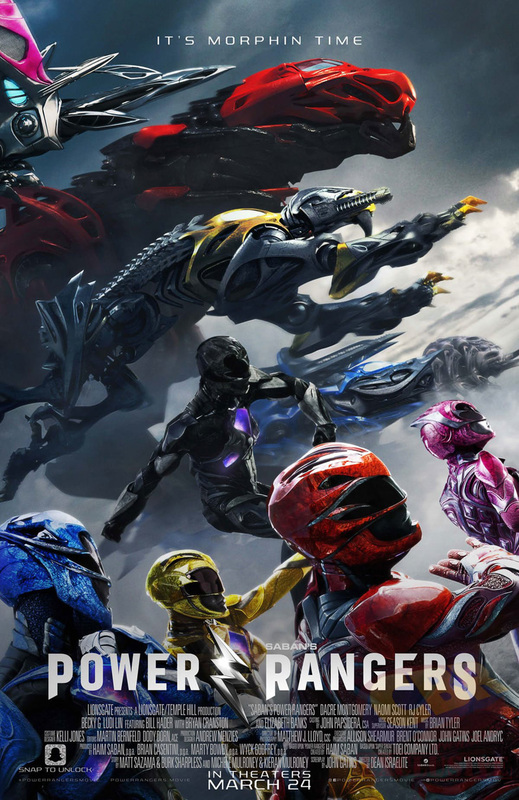 Power Rangers is the latest attempt to take a beloved childhood franchise and turn it into big screen magic. While I was never an avid fan of the show, I have seen a few episodes here and there. That said, you don’t have to well-versed in the Power Rangers series to appreciate the movie, but it does help to have at least a little familiarity with it. The actors playing the Power Rangers ,Dacre Montgomery, Naomi Scott, RJ Cyler, Ludi Lin, and Becky G., are relatively unknown. They work well together as the haphazard group of teenagers thrown into the position of saving the world. There is a fair amount of cheesiness to both the lines they deliver and their performances. It is a Power Rangers movie, after all. To give the film the star power to help bring in a bigger audience, they add in Bryan Cranston, Elizabeth Banks, and Bill Hader. These bigger names add a little heft and credibility to the film, even if their characters are over the top. The film gives us the back story to how the Power Rangers came to be. It wants to be taken seriously as a film, even if it doesn’t take itself too seriously. While a fair share of the campiness of the tv series has been cast aside, it isn’t completely gone. In fact, there is a direct call out to the series as they head into the final battle. My biggest complaint with the movie is that it takes too long to get things going. Too much time is spent pointing out the differences and conflicts between the characters. It isn’t until the last half hour or so that we finally get to the action. One of the highlights of the movie is RJ Cyler’s character, Billy, mentions that he is on the spectrum. This can be tricky to pull off in a film, but it is well done without turning him into a stereotypical autistic character. Power Rangers can be a bit dark and scary for younger audiences, especially towards the beginning. Once you get past that point, it is a fun movie that kids can enjoy and parents can reminisce about. If singing candelabras and princesses aren’t your thing (or you’ve already seen it), Power Rangers is a good choice for a family movie outing.